“Any of you ready for a “Puritan Christmas”?” Andreas Köstenberger asked, in his blog, “A Puritan Christmas”. Nevertheless, they may have a point. Does God Really See What's Going On? Concern. Angst. Apprehension. Anxiety. Trepidation. Fear. Worry. Sweltering heat; pounding heart; cramping pain in her throat and chest. Feeling as if crushed by a boulder, she gasps for air with lungs that just won’t fill. Lips parched and cracked. Desperate for water. Fleeing. Frightened; yet trudging on. A spring of water in the distance. If I can make it to the spring, maybe, just maybe. Ever feel like this? What? Isn’t this is a physical scenario? True. However, anxiety, worry, fear, etc. can cause this type of emotional experience. Pondering this remark caused me to ask why. Why do all humans have an innate understanding of right and wrong and desire to be treated fairly? From where did it come? And how do humans measure right from wrong? What standard do we use? And from where did we get that standard? I mean, we have a conscience, but what would have caused a conscience to develop if we are only evolved and not created? Do you like mysteries? I do to a point. As long as the mystery is solved with a happy ending, I enjoy the investigation, search, and resolution. But, without a happy ending, I’m disturbed. This is one reason why TV season finales sometimes make me crazy. The word mystery, according to the online dictionary, means something that is difficult or impossible to understand or explain. It can also be a novel, play, or movie dealing with a puzzling crime, especially a murder. Obviously, television dramas are the latter. But, in just living we come upon mysteries – things we can’t explain. Some feel compelled to investigate because they need answers – to find each puzzle piece, assemble them, and solve the mystery. Then we are satisfied and settled. Still, because of this desire within us to know the complete story, doesn’t it intrigue you when God speaks in the New Testament about a mystery kept secret since the world began? "Rejoice greatly, O daughter of Zion! Shout, O daughter of Jerusalem! Behold, your King is coming to you; He is just and having salvation, lowly and riding on a donkey, a colt, the foal of a donkey. This week commenced with what we know as Palm Sunday, Jesus’s triumphal entry into Jerusalem. 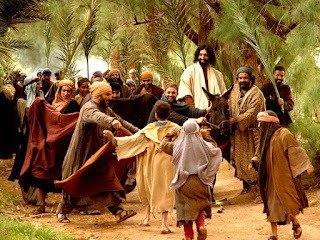 As He rode into the city on the back of a donkey, fulfilling Zachariah’s prophesy, some euphoric townsmen spread their cloaks on the road while others waved palm branches, hailing Him as Messiah, the Prince. When the indignant Pharisees asked Jesus to quiet his disciples He replied, “I tell you that if these should keep silent, the stones would immediately cry out.” Why? Because, this was the day – the day set forth by Almighty God through the angel Gabriel, concluding the second division of Daniel, the prophet’s seventy weeks.